Why is your website so awful? 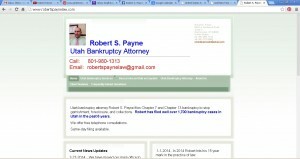 Shouldn’t I use an attorney who obviously spends more on his marketing and seo? Short answer: awful website = low advertising costs = I charge you less to file bankruptcy. My website is awful (your words, not mine), because I update it myself, and I am a 43 year old attorney, not a computer programmer or young seo specialist (“seo” stands for “search engine optimization”). I do not spend money on marketing, on seo, on my site, or on any real advertising besides keeping the site up through yahoo web hosting and listing it in online directories. So, it’s awful because I’m not spending money on it. This goes to the next question: should you use an attorney or firm who obviously spend more money on their website and advertising? It’s up to you. I would argue, no. My advertising cost is low, which means that I can afford to be a little cheaper, and that directly affects you. A friend of mine ran a larger firm and spent $10,000 a month on an seo contract for his lawfirm’s website. This means that he’d have to grind through 10 $1,000 cases a month just to keep the flash images scrolling across his screen for his website. Another friend hired $150,000 of fte’s (full-time employees) as a marketing department for his one man firm. Their websites and marketing were very pretty, but that kind of ongoing overhead is expensive and crushing. Even worse, it means that you have to charge more per case to make your clients pay for the marketing. So, no, I wouldn’t use an attorney with obviously better advertising, because it probably means that you’ll spend a little more. This is bankruptcy, and you need to make every penny count. I take full responsibility for the content and organization of my website, blog, and now, youtube videos (see: https://www.youtube.com/watch?v=1qoy4Nptjzg ). I also take full responsibility for having a do-it-yourself attitude that directly helps you. 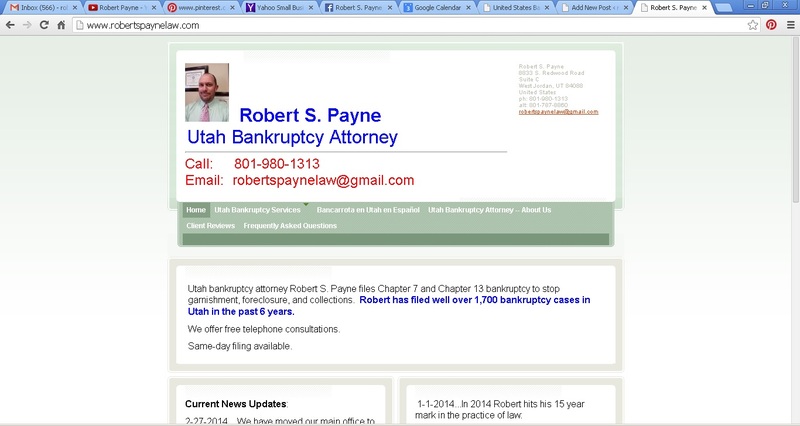 This entry was posted in Utah Bankruptcy on April 3, 2014 by robertspaynelaw.